The drive to Lauxmont Farms is breathtaking. As you reach the peak of Samuel S. Lewis State Park, the ribbon of the Susquehanna River unravels before you, and stunning mansions appear across the rolling hills. Depending on the time of day, the sun is either behind you, illuminating the landscape, or to your left and sinking into the River. You drive along the country road past the homes of York County’s wealthiest and descend the hill. At the bottom, you can either turn right to climb another hill towards the Farms and white rotunda, or left to enter the Gardens. The paved entrance to the Gardens is lodged between stone walls and lanterns. The winding road passes a cobblestone courtyard and a stone house with yellow shutters (where us girls got ready). And you can see horses grazing in the fenced pastures. 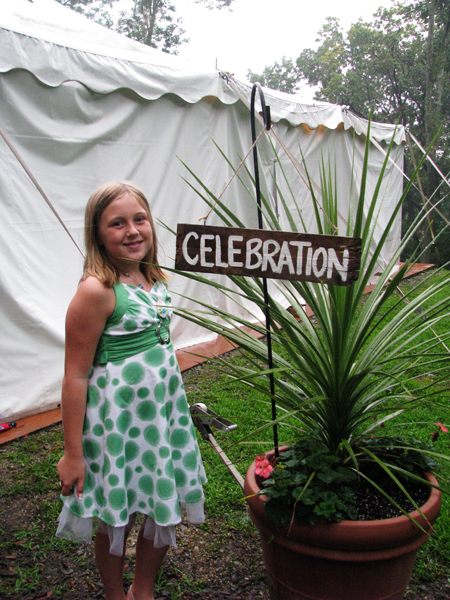 This sign awaited our guests on August 28th. Before guests reached the Sunken Garden and its storybook setting, they were greeted by attendants on horseback. 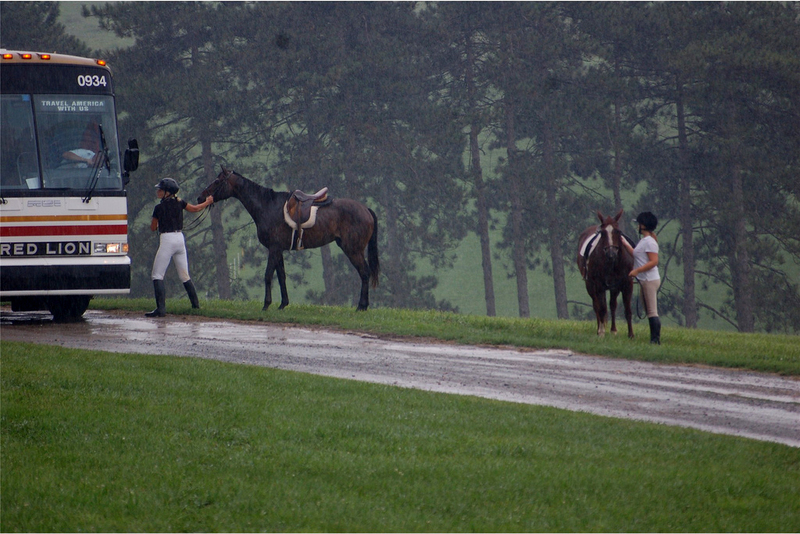 It is a horse farm, after all. And, yes, this bus was full of our family and friends. And, yes, it was raining when they arrived. 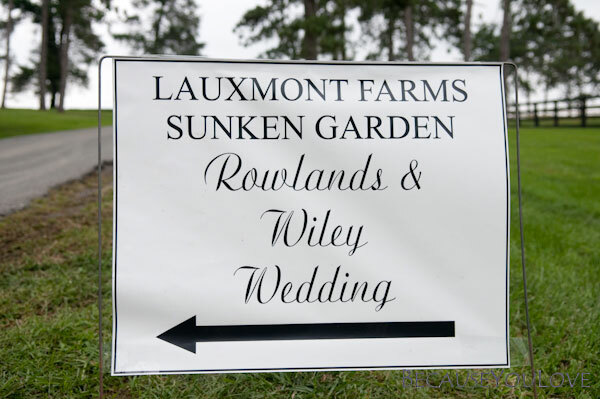 Guests parked their cars (or climbed off of the bus) and followed the barn wood sign that said “Wedding.” They walked the (muddy) trail and reached the stairs to the pool house. And this is where plans changed. 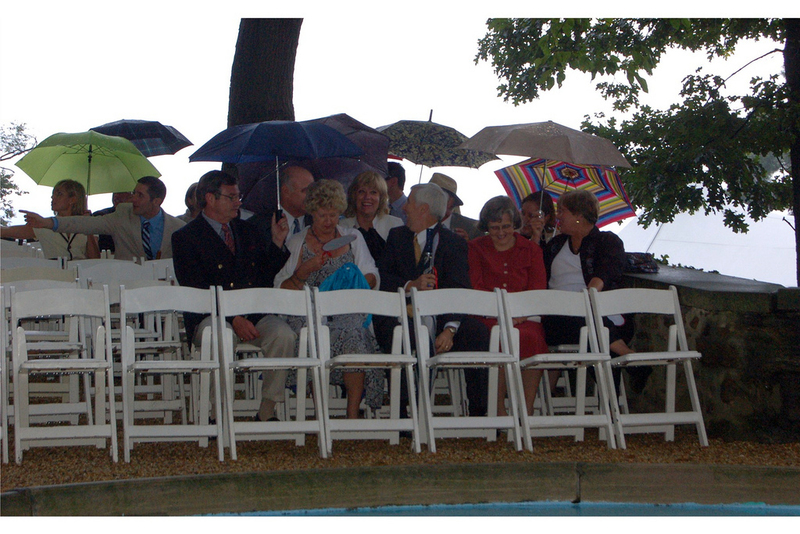 Rather than taking a bottle of water and a ceremony program fan and sitting in a white wooden chair around the fountain as the sun set behind them, guests sought shelter from the rain under the reception tent. Yes, this means they saw the decor before they were supposed to, but I heard they had a pretty good time under the warm white canopy. 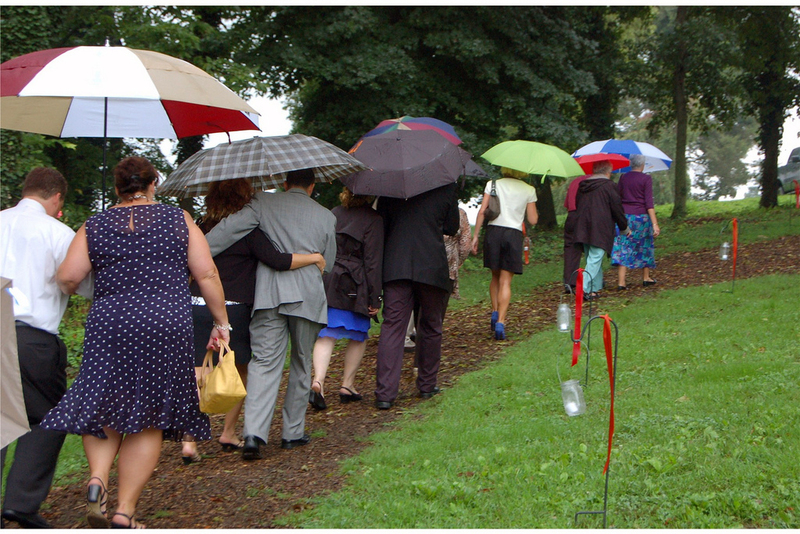 Our guitarist played a selection of rain songs, like Bobbie’s Song by John Denver — “I’ll walk in the rain by your side.” A few guests even took the unexpected opportunity to get a drink from the bar. And then they waited. Patiently. After about 20 minutes, our coordinator, Betsy, invited guests to come back to the garden. She had been closely monitoring the satellite on her iPhone and saw a 30 minute window. So she called on a crew of farm hands, seriously, to dry the seats with paper towels. Next: What were we doing while our guests were waiting? I love this freaking wedding. ha ha. I am a creep but I love it! 🙂 So gorgeous and it’s funny but I LOVE The umbrellas! They make it so cute and unique!